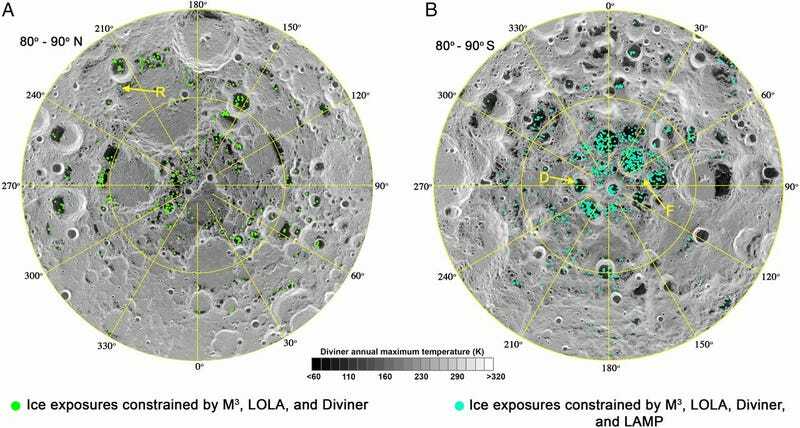 A team of researchers has spotted the signature of water ice in permanently cold traps near the Moon’s poles, a new paper reports. Mars, the dwarf planet Ceres, and even the planet Mercury have water ice on their surfaces, the latter two in permanently shaded areas like craters. But directly detecting water on the Moon has remained a challenge. Today, scientists have finally directly observed evidence of the water ice on the Moon using spectral lines. “The observation of spectral features of H2O confirms that water ice is trapped and accumulates in permanently shadowed regions of the Moon,” the authors write in the paper published today in the Proceedings of the National Academy of Sciences. Ceres, Mercury, and the Moon all tilt slightly in relation to the Sun, leaving some craters in permanent shadow. These regions can be extremely cold, down to -261.67 Fahrenheit (-163.15 Celsius) — the only heat they receive is the heat from reflected sunlight and from the celestial bodies themselves. You’d think these regions would accumulate some solids, like water ice — and they have, on Mercury and Ceres. But scientists only had somewhat ambiguous evidence of the same ice on the Moon, thanks to the Lunar Reconnaissance Orbiter (LRO). The biggest issue was that the LRO’s instruments measured water ice’s characteristic interaction with certain light wavelengths, or spectra, in the ultraviolet. But the ultraviolet signatures might have come from other molecules, such as hydroxide — OH, rather than H2O. The Moon Mineralogy Mapper (M3) instrument onboard India’s Chandrayaan-1 spacecraft instead looked for water ice absorbing three specific wavelengths of near-infrared light. “The cooccurrence of all three absorptions would be evidence for water ice,” the authors wrote. So, the scientists measured light that bounced off of walls or hills and onto the permanently shadowed regions. They found their spectra, and the ice — but it was less than they expected. “In total, only ∼3.5% of cold traps at both lunar poles exhibit ice signatures,” the authors write — and while the cold trap deposits on Mercury and Ceres appear to be nearly entirely ice, the ones on the Moon seem to be only 30 per cent ice. Analysing the data wasn’t easy. “When Shuai Li,” the study’s first author from the University of Hawaii, “first described what he wanted to investigate using M3 data, I thought he was crazy,” Carle Pieters, a planetary scientist at Brown University not involved with the study, told Scientific American. She explained that scientists had given up looking through M3's poor-quality data, but that Li persevered using many statistical tests. She said that she was convinced by the paper. Why does the moon have less ice than they expect? They don’t know yet. That’s up to future research.